When you’re working with the VMware infrastructure, you want to make sure that you have the right kind of storage implementations in place. Avoid the nightmare of running out of data space with the assistance of the Storage Implementation in vSphere 5.0. This vSphere storage guide is easy to read and allows you to store and manage your data efficiently on the VMware platform. When it comes to understanding every topic addressed about VMware, it can be quite challenging. Many guides can be dense and have poor structure. When writing this storage implementation guide, author Mostafa Khalil organized the topics in a way that would allow readers to understand what was being said without getting lost. His guide includes insights for better architectural design, planning and management practices, configuration details and external storage-related technologies. How do you configure storage array from "Vendor X" to support vSphere "Feature Y"? How do you know you've configured it correctly? What happens if you misconfigure it? How can you tell from logs and other tools that you have a problem - and how do you fix it? 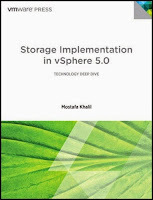 If you’re an IT professional looking to get the most out of storage virtualization on the VMware platform, this vSphere 5.0 guide will provide you with the insight and information you need. Gain an understanding of this topic and master storage implementation when you order this book today! I think that people who have grown up with the idea of using computers are showing more responsibility towards writing posts that are thoughtful, do not have grammar mistakes and pertinent to the post..
this blog clearly explains and it is really interesting very much and very nice to see these kind of explanation it is really true. Thank you for taking about for time provides valuable posting.We share it information passage all our candidate knowledge is excellent.Always, I've to fully read your sites , I'll be confidence learning knowledge levels. I am very thankful and u posted nice article with valuable information.Vmware Jobs in Hyderabad. Nice post. I love the way you explained this blog and shared it with everyone. If you are looking for self storage services,then you can contact safestorage for more information.